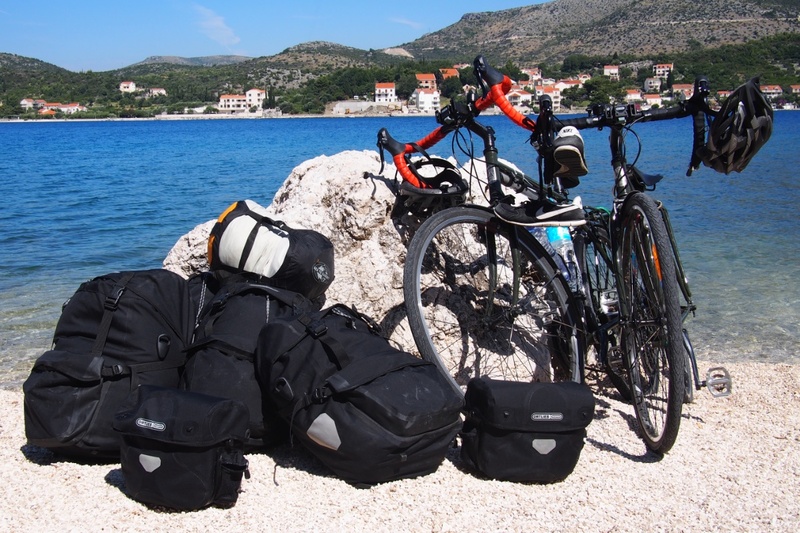 Our aim for our bike touring gear was to travel as light-weight as possible but still travel in relative comfort. We wanted to reduce fatigue on the bikes, and ourselves, and be able to ride with relative agility and enjoyment. 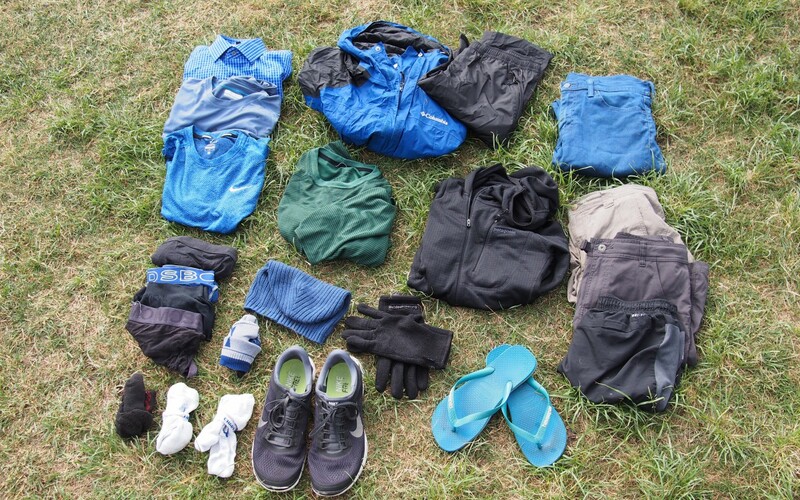 By no means is this an extreme light-weight touring list (we did not cut the handles off our toothbrushes) however everything fits into our rear panniers and handlebar bags. The majority of our gear was from already owned items. We first looked at what we had at home to save on costs. We camped a fair bit so we already had a tent, sleeping bags, trangia etc. Most of the bike related items were bought new with lots of research and thought. Higher quality items are almost always more durable, thinner, warmer, lighter etc and can drastically reduce the weight you’re carrying. We will be replacing some of our ‘brought from home’ gear with lighter variations once they wear out. 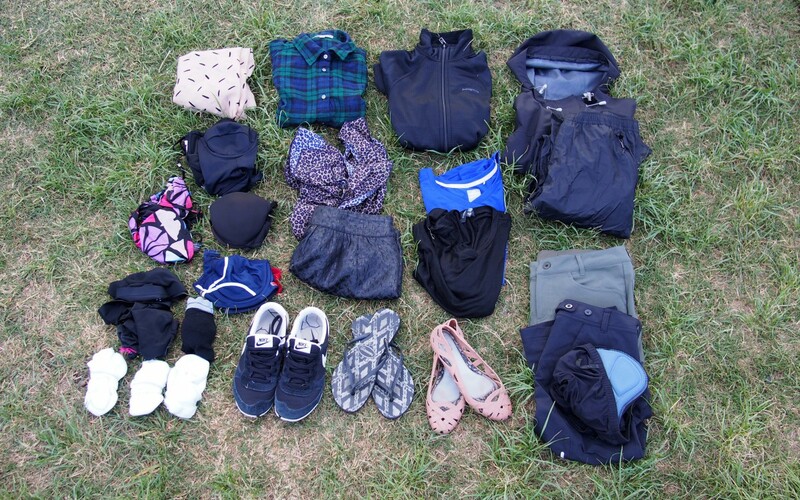 The list below is our full packing list and will change slightly as we travel along, items will come and go as we reevaluate their usefulness and our needs for different countries. For Malaysia and Thailand we stored a lot of our gear in Singapore with relatives, namely cooking, camping and winter gear. For that gear list please see here. Hey guys, how do you like your Fuji bikes?? Thinking of upgrading ours before a big trip and I’m thinking of the Fuji touring 2016. Thanks for the question Elizabeth! It was love at first sight with our Fuji’s; strong, comfortable and great to look at, and the price point isn’t too shabby either. A main area to look at for your trip is terrain. We chose Fuji as a discrete road bike; could go the km’s but still not look out of place commuting, and last for years. Our trip has been mainly road with off road only if the situation dictated. Cleave has gone through more tyres/punctures than me, (more weight in the back), but buying the best tyres as possible, rather than using whatever they had in the shop/country at the time would solve this. We’re going to upgrade to all Schwalbe and also look at increasing the tyre width for more flexibility and less issues. It’ll really depend on where you’re going and how off road you’re thinking. Let us know what bike you decide on, looking forward to checking out your trip! Yeah our travel insurance doesn’t cover our bikes too. Such a pain! Hmm ok. We used marathon schwalbe over Europe and not one puncture so definitely upgrade the tyres! They’re amazing! Our trip won’t just be on roads – so we’ll definitely need thicker tyres. Definitely not anything like mountain bike riding but will need something for dirt and unpaved roads. I just love the look of your fuji bikes! We’re thinking about it… I want us to have disc brakes and wider tyres, but our fork width is fairly narrow. We don’t know much about bikes so we’re talking with our dealer to see what we can do. If we can’t do much, we’re looking at trading and upgrading. This is such a great blog! I have a question about your touring. It looks like you kept the standard rack. How did that hold up? We did keep the standard rack, we wanted to use everything as much as possible as the bikes were new, and then replace things as they wear out. We haven’t had any issues as of yet. All of our weight is in the back, we just regularly check all the screws are still tightened. Cheers! Awesome blog! Was looking at one of these bikes for a tour down the west coast. Curious what your heights are. I’m 5’7″ – 5’8″ and between the smaller frame and medium frame. Also, how were the rims and such overall? Hi Zac, thanks so much for your question! You’re 3 inches taller; I’m 5’5 and on the small frame, which is bang on perfect for me. It really depends on your riding style/flexibility, but if you’re thinking of reach, one option would be to look at how short you can go in the stem, if you go up in the frame. We’ve only had two loose spokes in a year, but also they’ve all rusted really quickly, which is a bit disappointing. We also swapped out the pedals, seat and tyres from the standard issue. 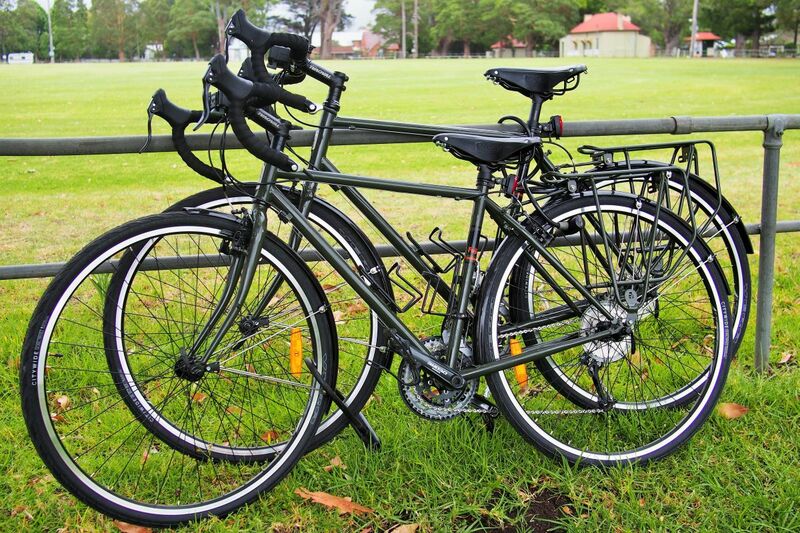 However all in all, we’re really liking the bikes for the price point – good luck on your West Coast ride! Hi there I have a Fuji touring as well, is is a great bicycle, but the tires definitely need to be upgraded of going to go touring (for commuting in the city they are fine), I did try fitting Marathons 700 x 38c but the clearance of the frame it is too close so ended up settling for the 700 x 38c Schwalbe Marathons they look great and are a very confortable fit, I also fitted the brooks B17 saddle not because the original saddle isn’t confortable, but because I always wanted to try them and in my old MTB they would look out of place but in the Fuji touring it looks like it was ment to be it fits and feels great, I found that the stem of the Fuji is a bit of stretch for long rides what can make some beginners feel a lot of discomfort on their hands and for this reason I replace the original oval stem for a higher one and that did the trick, now the bike is perfect at list for me, for you to get something similar to what I now have out of the shop you would need no less the £1000 pounds and I did build mine with all that for £750 pounds including also SKS mudguards and aluminium bottle cages. Sounds like you’ve got a great Fuji there Jonathan! The price point is great isn’t it. We also have Brooks B17 saddles, they’re so comfortable. Good point on a higher stem, I would be interested in looking into that for me. Thanks for the info, good luck on your rides! What tire size did you finally fitt in? 38c or less? What do you mean by “a bit tight”? I’m planing to drive in mixed tarrain and 40 mm would be the perfect size. Please define is it possible or not. What kind of trouble did you have, if you did have some? The 40mm was fine through the frame forks, but it was really tight with our mudguards on, it barely cleared them. So if you’re considering them, you may have to consider none or different mudguards. But ask a bike shop for advice on your set up for sure. Hope that helps Anel!